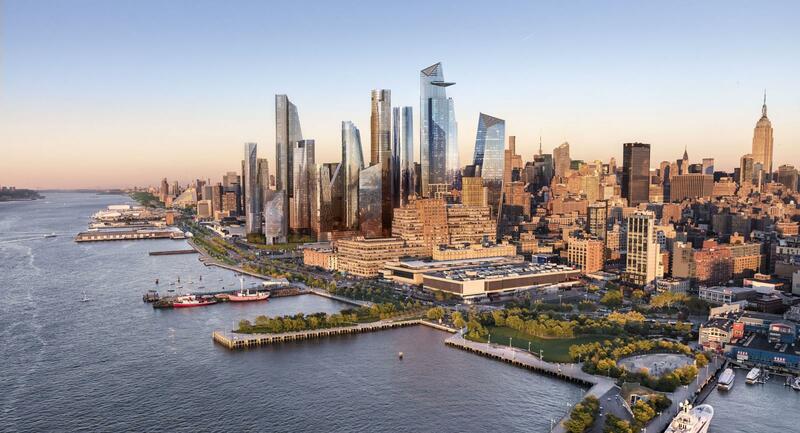 Search results for "Hudson Yards"
Missed some of this week’s architecture news, or our tweets and Facebook posts from the last few days? Don’t sweat it—we’ve gathered the week’s must-read stories right here. Enjoy! 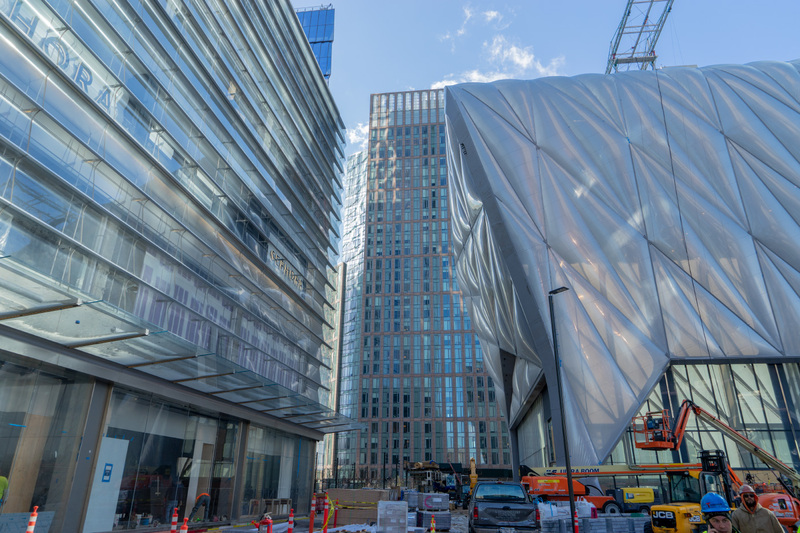 Take a sneak peek at Hudson Yards ahead of its March opening Can't wait for the new neighborhood's March 15 opening? AN took a behind-the-scenes tour before the official ribbon cutting. nARCHITECTS’ Equal Rights Heritage Center frames the history around it The Equal Rights Heritage Center, the first new municipal building in Auburn in 40 years, puts New York's contributions to equal rights front and center. 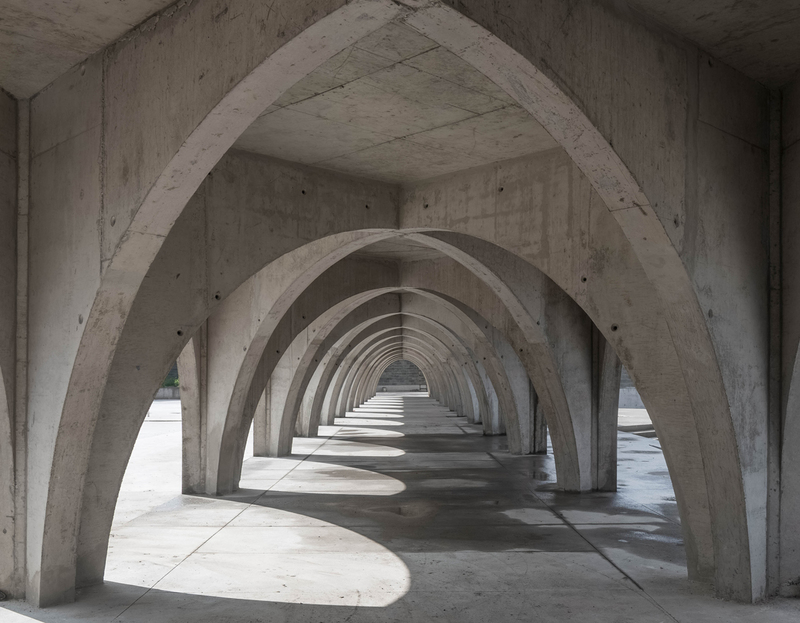 Mario Botta’s sanctuary for cosmopolitan super chickens rises in Belgium In the small city of Genk in Belgium, Mario Botta has designed a studio for Koen Vanmechelen as part of the artist's Labiomista project. 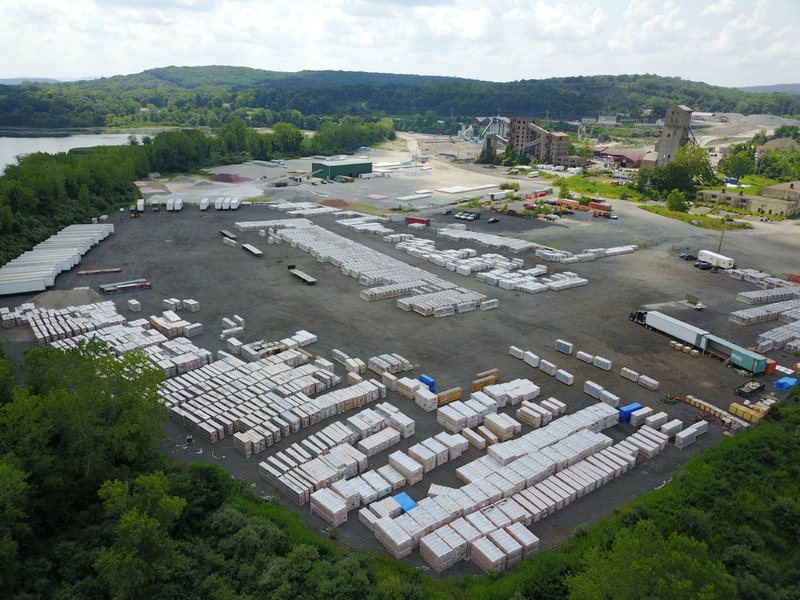 AIA issues statement of support for proposed Green New Deal legislation The American Institute of Architects (AIA) released a statement supporting Green New Deal legislation proposed by congresspeople last week. Junya Ishigami chosen to design the 2019 Serpentine Pavilion Ishigami has designed a single-layer slate canopy for the 2019 Serpentine Pavilion, creating an indoor-outdoor space that references natural rock formations. Have a great weekend, and see you Monday! The first phase of Manhattan’s massive Hudson Yards project opens to the public in only a month, and AN took a behind-the-scenes look at the new neighborhood. 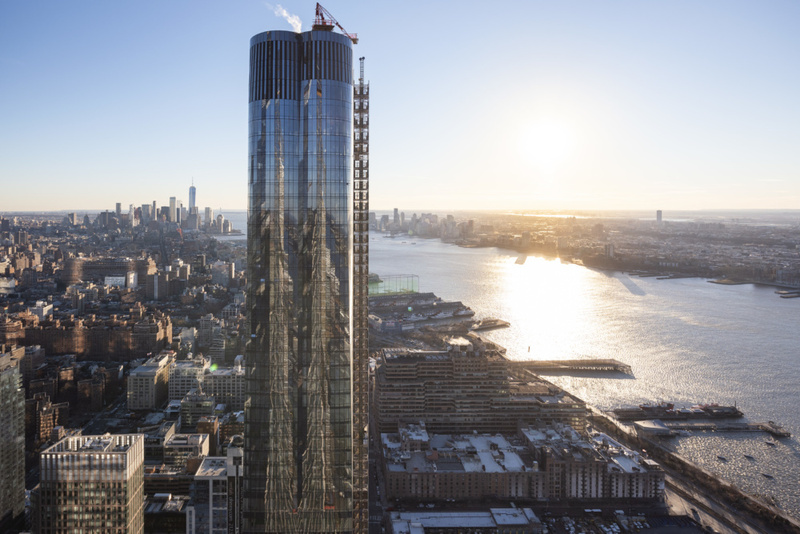 Much of the office space in 10 Hudson Yards, the Kohn Pedersen Fox Associates (KPF)–designed glass tower at the corner of 30th Street and 10th Avenue, is occupied, but work on the neighborhood’s public-facing and retail components will continue until the March 15 opening. 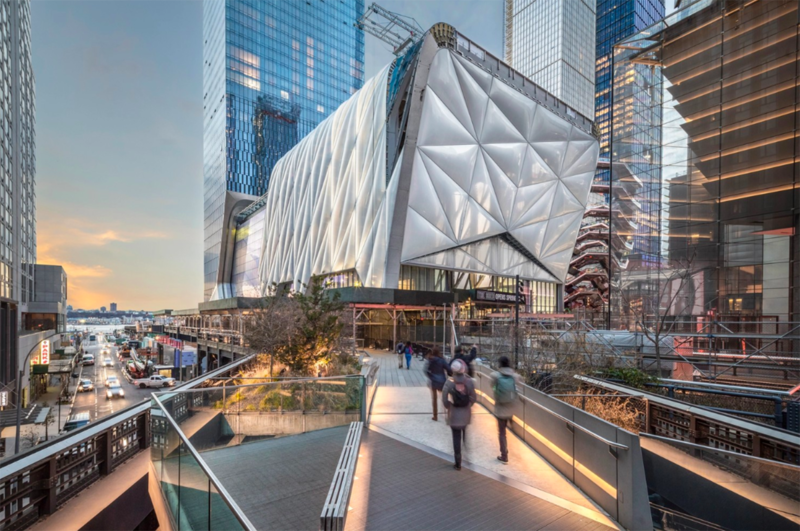 After that, the Shops and Restaurants at Hudson Yards, the seven-story, one-million-square-foot Elkus Manfredi Architects–designed retail hub will be open for business. Besides multi-floor retail outlets for a number of fashion stalwarts and brick-and-mortar space for formerly online-only retailers, the second floor of the Shops will hold a permanent exhibition space curated by Snarkitecture. The Snark Park will hold open its inaugural show, Lost and Found, on March 15 when visitors will weave between crumbling columns—limited edition recreations of which were given away at KITH’s SoHo store on January 31. That retail integration will follow through to all of Snarkitecture’s future installations in the space, and developer Related is planning to rotate exhibitions three times a year, with associated “retail drops.” The Shops building, which is wedged between KPF’s 10 and 30 Hudson Yards buildings, also features a cogeneration plant that can convert waste heat into thermal energy. 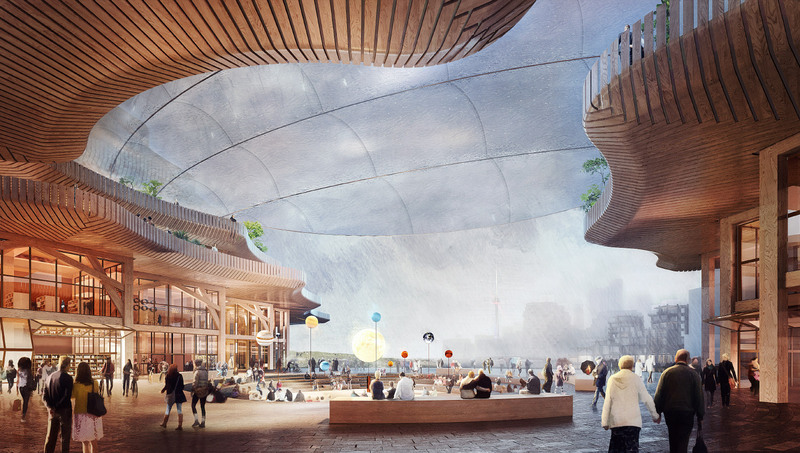 All of the buildings are networked in a micro-grid and can send their waste heat to the plant, creating a system that uses less energy than comparably-sized towers. 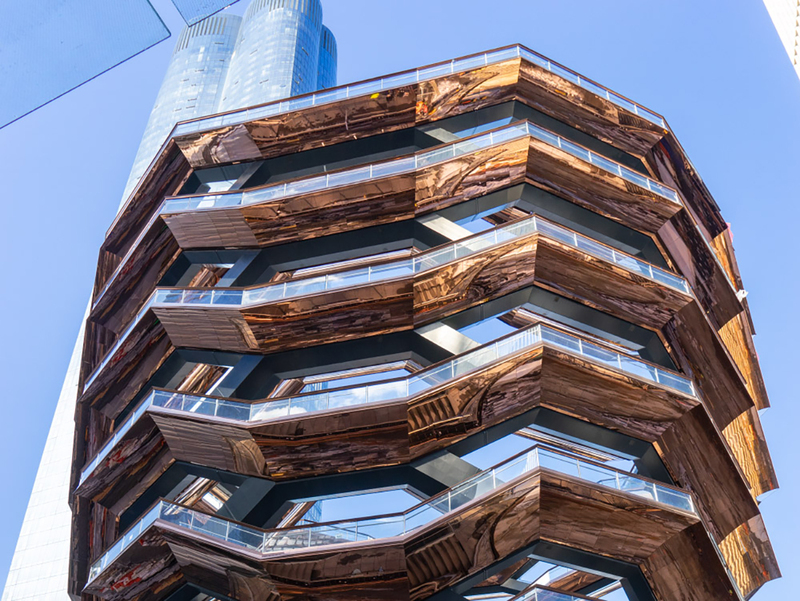 An outdoor dining terrace will also let visitors peer into the Thomas Heatherwick–designed New York Staircase (formerly known as the Vessel) as they eat. The entire building is designed to be porous and allow foot traffic in from the adjacent buildings, the 34th Street 7 train station via an underground corridor, and to visitors from the High Line. To the site’s west is the still-uncovered rail yard, which will eventually be decked over for Hudson Yards’ second phase. Whereas the first phase is 80 percent office and retail space, and 20 percent residential, the second phase will flip those numbers and create more housing. 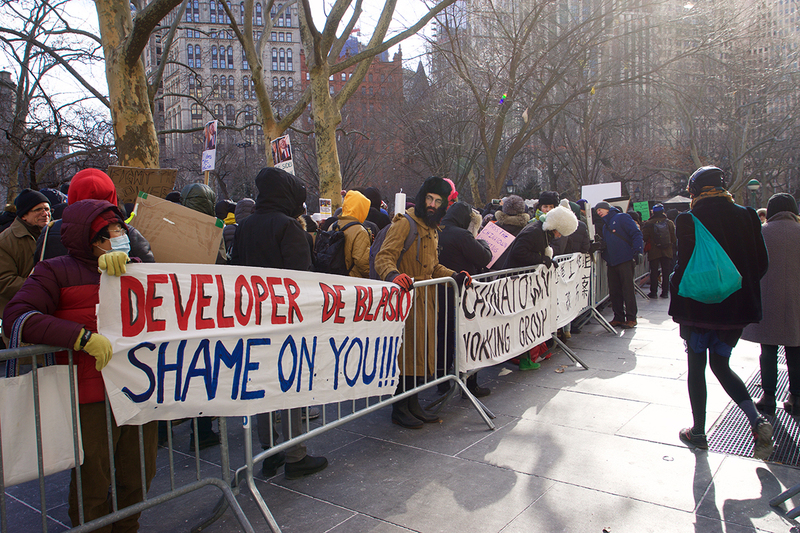 Related claims that the project will create 1,000 affordable units overall, though there is no target completion date for the second phase. For Ben Waechter, practicing architecture is an investigation into creating spaces with clarity. ... “To us, a strong sense of clarity tends to be in places that simply feel the best to be in,” [Waechter] said. According to Waechter, that’s one of the main themes that must be teased out when reviewing a project. Phu Hoang and Rachely Rotem…blur the boundaries of their practice, working in multiple modes simultaneously. Their conceptual work, built work, research, teaching, and urban initiatives inform one another and allow the firm to continually develop, test, and refine their ideas. Through discourse and design at scales both large and small, MODU’s indoor cities and outdoor rooms ultimately ask one question: How can we live better? Partners Trattie Davies and Jonathan Toews are no strangers to working around tight spatial and financial limitations. Whether it’s a linear park that rises between a descending set of switchback staircases in Hudson, New York; a perspective-defying, split-level park and art gallery in Memphis, Tennessee; or a three-story townhouse in Brooklyn, their projects are united by the common thread of extreme site-specificity. “Our strategy has been: Do first, analyze second,” said Davies. 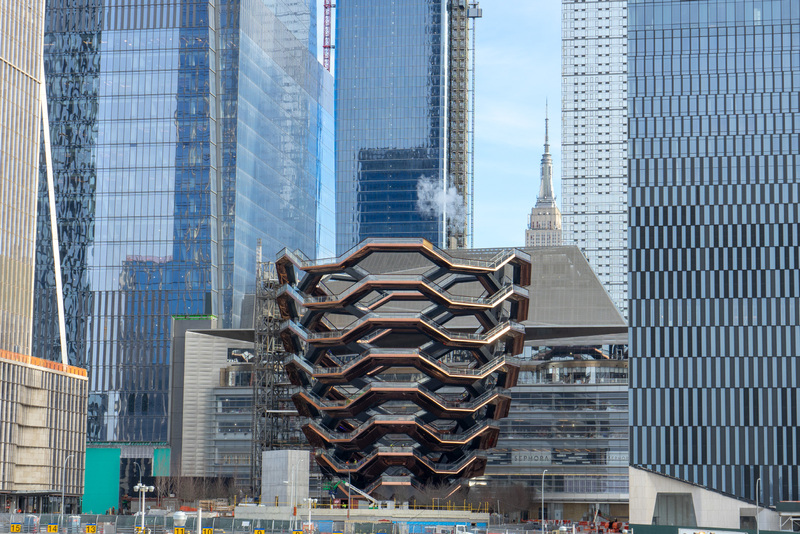 For over three years, New York City has anticipated the debut of Hudson Yard’s enigmatic “Shed”: the eight-level, 200,000-square-foot art center with a massive, telescoping outer shell. On April 5, the new center will finally open its doors, hosting a variety of exhibitions, lectures, and events related to the performing arts, visual arts, and pop culture. The innovative building was designed by Diller Scofidio + Renfro, lead architect, and Rockwell Group, collaborating architect. Its sleek, flexible, and mobile layout was inspired by the industrial past of the High Line and West Side Rail Yard, and the building’s form is intended to physically transform depending on artists’ visions. Its blueprint includes two levels of gallery space, a multipurpose theater, a rehearsal space, a creative lab, and a 9,500-square-foot sky-lit space for large-scale events. Reminiscent of a train car, the building’s semi-transparent outer shell can glide along rails onto a neighboring plaza to nearly double the building’s footprint for grandiose concerts and performances. The massive light, sound, and temperature-controlled hall can be used as a blank slate to support artists' and performers’ most creative and ambitious ideas. “We have built a home where established and emerging artists working in all disciplines can create new work in ways that we cannot even imagine,” said The Shed’s Artistic Director and CEO, Alex Poots. The venue will host an assortment of events ranging from comedy shows to concerts. The first year of programming will include lectures by filmmaker Boots Riley, a Björk concert directed by John Tiffany, and a Kung Fu musical featuring songs by Sia. 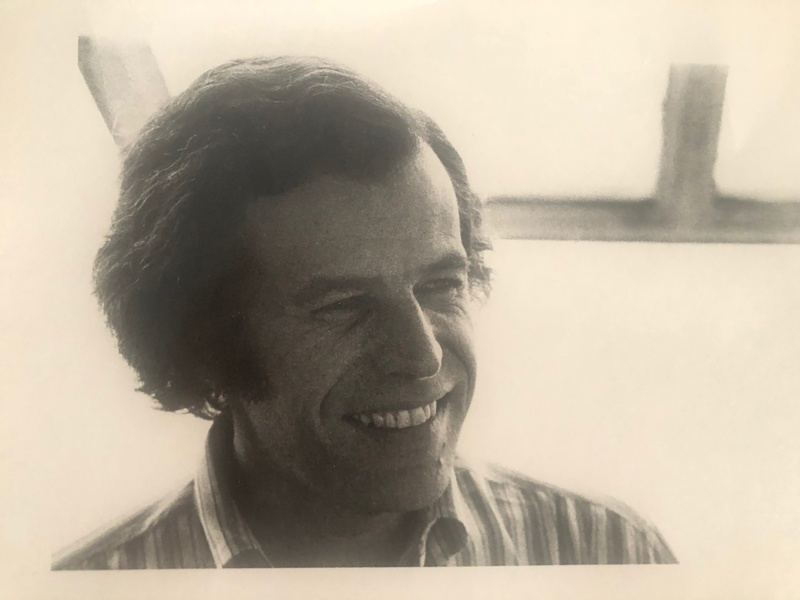 The building will be named to “The Bloomberg Building” after a generous, $75 million donation from Michael Bloomberg, the former mayor who oversaw the dramatic gentrification of Manhattan’s Westside and Hudson Yards. With only three months until its launch, The Shed will go through the final phases of construction, which includes the installation of metal cladding and other architectural finishes. Correction: A previous version of this article said that The Shed's name will change, but only the building the institution is housed in will be known at The Bloomberg Building. Missed some of this week's architecture news, or our tweets and Facebook posts from the last few days? Don’t sweat it—we’ve gathered the week’s must-read stories right here. Enjoy! Repair plan for shuttered Transbay Transit Center is in the works The Metropolitan Transportation Commission approved a repair plan for the Transbay Transit Center that the Transbay Joint Powers Authority will consider. 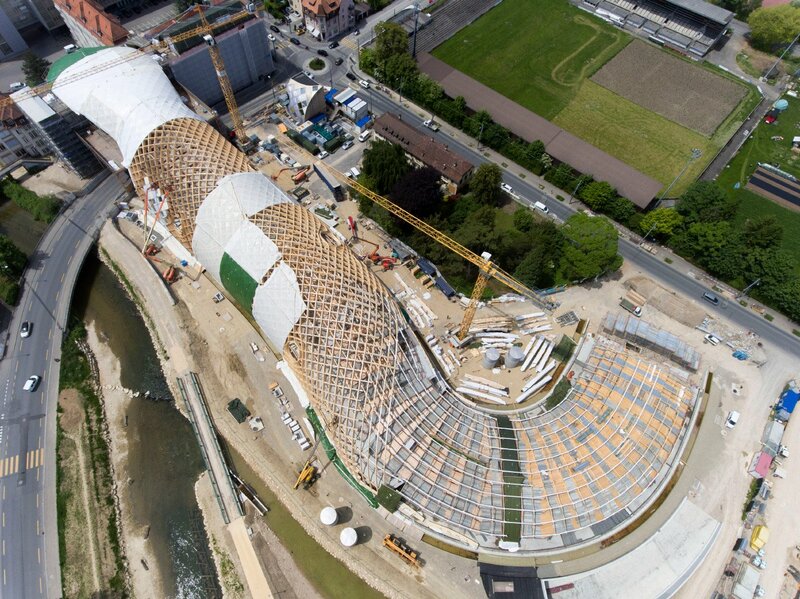 Shigeru Ban Architects burnishes its status as a leader in mass timber Known for experimenting with paper tubes and bamboo, Shigeru Ban Architects is burnishing its reputation in tall and mass timber. Preview Heatherwick Studio’s upcoming New York City projects Heatherwick Studio has three projects under construction within a 19-block span of Manhattan's West Side, and AN took the opportunity to check in. Seattle set to finally close Alaskan Way Viaduct and open new tunnel The two-mile Alaskan Way Viaduct, long been considered a major hazard to the city and its drivers, will close this Friday, January 11. United States withdraws from UNESCO (again) The United States has withdrawn from UNESCO in protest of the organization's recognition of cultural sites in the West Bank. That's all—see you next week!